Carolyn Folkers is a second-generation horsewoman, following in the footsteps of her father. During her early years in Lenox, IL, Carolyn shadowed her father, helping in every way possible in the barn. As a young girl, Carolyn was very shy and did not have any interest in showing horses - she preferred staying behind the scenes and working with the colts. 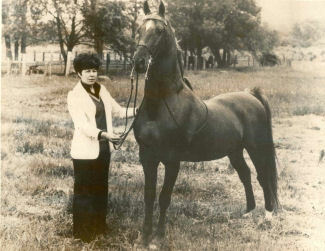 Eventually, Carolyn got "the bug" and entered the show ring with much success, becoming one of the first women road horse drivers on the Mid-West circuit. 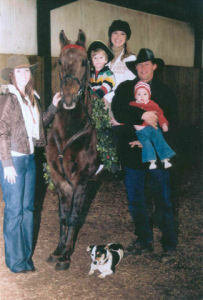 She has also taught many successful equitation and performance riders, including her daughter, Karin Lynn Folkers Smith. Carolyn is very active in the promotion of the American Saddlebred. She sees the breed as the perfect horse for families, and believes that involvement with horses can be a huge benefit to children, teaching them responsibility, a strong work ethic, and good sportsmanship. While in Illinois, Carolyn helped to organize "mall shows", where exhibitions of the American Saddlebred were held at local shopping malls. In 1996, Carolyn and her family relocated to Virginia. She became a member of ASHAV and has been a big supporter of the Old Dominion Futurity. In 2001, Carolyn organized and started the Old Dominion Futurity Benefit Horse Show, which has become a yearly event. All proceeds from the show benefit the Old Dominion Futurity, helping to ensure the preservation of the American Saddlebred breed in Virginia. In 2007, Carolyn visited the Washington International Horse Show, where she talked with the show's organizers and arranged an exhibition of the world's best Saddlebreds and Hackneys to take place at the 2008 Washington International Horse Show. It is her hope that this exhibition will be picked up by major television, and will further expose the public to the American Saddlebred. In 2008, Carolyn was awarded the ASHAV Service Award for her efforts to promote the Saddlebred and her support of ASHAV. Karin, a third generation horsewoman, is no stranger to the show ring. She has trained numerous champions, most notably WC CH The Red Ferrari and WC CH Keeper of the Stars. Karin is best known for being able to bring out the best in young horses. She sees each horse as a "blank slate" and works with the horse's natural talent to bring out the best results. She believes in ensuring that every horse she trains goes on to have a happy and productive life, whether that be in the show ring or as someone's personal pleasure horse. Karin is a firm believer in having her riders compete in equitation, as she believes that being a good equitation rider equates with good horsemanship. She has seen her equitation riders win at the local and national level. Karin's children, Justin and Katelyn Smith, are following in their mother's footsteps. Justin, an upcoming Kindergarten student, is preparing for his show ring debut in walk & trot, and Katelyn is not far behind him! Windy HIll Farm is located at 3749 Elon Road in Monroe, VA. Nestled in the middle of the Blue Ridge Mountains, Windy Hill Farm is only 45 minutes from the Virginia Horse Center, 1 hour from Charlottesville, and 25 minutes from the Lynchburg airport. A visitor’s first impression of Windy Hill Farm is the magnificent view of the Blue Ridge and surrounding countryside. The second feature noticed by the visitor is the large modern barns. The Windy Hill location has been a working farm for over two hundred years and was owned in part and at different times by such prominent Amherst families as the Ruckers, Carters, Cheatwoods and Tinsleys. Ruth Wood Davis, wife of John D. Davis, Jr., acquired 1216 acres about 1930. 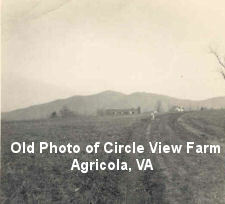 Later her son James Wood Davis and his wife, Corinne, operated a cattle farm there, calling it Circle View Farm. James W. Davis was a Virginia State Senator from this district for many years. During the Depression years, the Davis family hosted community dances in the haymow of an old barn. Birthdays were celebrated on the lawn and an occasional wedding party was held at the house. The house probably started as a simple farmhouse in the early twentieth century. Additions were made to each end of the two-story house and a kitchen ell was attached to the rear. The comfortable home features a large dining and living area. Today these rooms are accented with rocking horses and other horse memorabilia. Our barns feature 80 stalls and two indoor arenas. Outdoor amenities include a riding arena, four board turnout paddocks, and plenty of trails on over 300 acres. Day and Overnight camps are offered during the summer, and the beautiful scenery makes this the perfect spot for a special event.